Anything that helps us, individually and collectively, to love more and love better, is worthwhile. . . . I believe your readers will find his or her love “pearls” among your wealth of experiences, explanations, Scriptures, and inspirations. Imagine immersing yourself in a bath of pure love, and lying in it until your whole being has been saturated, revived, and set free to be God’s gift to the world around you. That’s what reading this book is like. 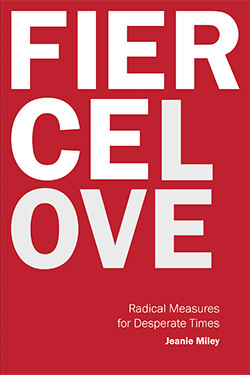 Fierce love—not an ordinary, anemic kind of love that we so often imagine and try to practice, but a love that is vigorous, unrestrained, and completely overpowering. That’s what Jeanie Miley presents in this extraordinary book. I won’t ever be the same after reading it—and neither will you! Putting the words fierce and love together is only the first surprise of many in this guide to a healthy heart by Jeanie Miley. In her characteristic way, she takes you deeper than you thought you wanted to go only to find that when you do, fear gives way to love again and again. Books on God’s love never go out of fashion. No doubt it is because most of us struggle to believe that beneath all the suffering, failure, and conflict we see around and within ourselves, what remains is a God who loves. Jeanie Miley—an admitted learner on the subject of God’s love—adds her voice to the chorus of saints who have staked their hope on nothing less. Jeanie is a good friend to have on this journey. Take and read. Above the accusatory jangle of a world grinding its gears, Jeanie Miley’s Fierce Love is a descant so clear and true, it makes me want to weep and pump my fist at the same time. There can be—and are—some truly wise books about love. There are, however, very few books about love that are practical. The unique thing about Fierce Love is that it manages to be both wise and practical. It is also, by the way, gentle, rich, personable and, in places, downright beguiling.